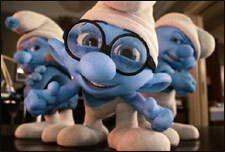 The Smurfs, an English movie, is not currently screening in Hyderabad. Did you know that Peyo's little blue people were perceived as communist propagandists? Apparently, their little village, utopian as it was, was considered Marxist. This was in the 1980s, and things have changed over the past few decades. These days, the Smurfs are nothing more than harmless little things, brimming with cuteness. fullhyd.com has 700,000+ monthly visits. Tell Hyderabad what you feel about The Smurfs, and then also see all user reviews for The Smurfs!